Whether this is your first child or you’re a seasoned parenting pro, putting your little one to bed can be an anxiety-filled experience. The mattress in their cot needs to be comfortable, supportive and, above all, safe. But what features should you look for and what should you avoid? After my first child was born last year, I was completely overwhelmed. Every potential product purchase filled me with anxiety. 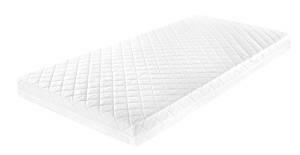 While there are plenty of baby guides available, I had a difficult time finding accurate info on what type of mattress to buy for my daughter’s cot bed. When a baby is on the way, you can often save a ton of money by accepting previously used items from other parents you know or using hand-me-downs from your other children. But you always want to purchase a completely new mattress for each child. This is the only way to ensure proper hygiene. Improperly stored mattresses can develop mold, which isn’t always easy to see. Plus, toddler mattresses are generally exposed to a lot of liquids including many biological fluids. If not cleaned correctly, bacteria can thrive. You can’t always detect a dirty mattress by sight and smell, so the only way to ensure proper hygiene is to buy new. Should You Care About Warranties? Yes and no. A warranty can be great if your toddler mattress arrives defective or develops an obvious problem right away. But don’t pay extra for a warranty and don’t put too much stock into a warranty which applies for years down the line. As long as you keep the mattress clean, a well-built one will typically last for many years without issue. When shopping for a spring mattress you want to consider the number of layers, what each layer is made of and the type of covering is used. Generally, more layers equal better quality. You want the springs to be made with high-gauge steel. This results in more cushioning and better overall support. As the number and quality of springs increases, so does the weight. However, baby mattresses rarely become heavy enough to be an issue. When selecting a spring mattress, pay attention to border rods. These are rods which line the inside perimeter. They provide firmness, durable and side support. Border rods are a necessity in a spring mattress. They prevent from sagging if your child stands near the edge. Without border rods, your child can lose their balance and potentially become injured. Check for coil count. This is the number of springs inside the mattress. A high coil count is often a big part of marketing efforts. While many springs can lead to increased firmness and stability, that’s not always the case. A better way to evaluate is to look at the quality of each coil. You want coils which have a high percentage of steel in each spring unit. Steel thickness ranges from 19 to 12.5 gauge. Lower gauge is thicker. The best baby mattress will have a medium to high coil count, and each coil will have a reasonably thick gauge. Generally, you want to aim for a coil count between 125 and 150 with a gauge or 15.5 or lower. Be wary of extremely high coil counts, especially counts over 200. The gauge strength will typically be very low. This type of mattress won’t be nearly the same level of firmness and comfort as one with fewer coils but stronger individual springs. Of course, you certainly don’t want the coils to poke through the surface. That’s where the insulating pad comes in. This is a thick pad on top of the springs which prevents any accidental injury. Next is the cushioning layer. This is the layer above the coils and below the pad. Avoid polyester cushioning, which has a tendency to form pockets. Pockets are areas where the coils poke through the material. The best cushioning layers are made from a blend of foam, cotton, and polyester. In this case, polyester is fine because it’s augmented by the foam and cotton. There’s a trick to know here. A high-quality product will list the components of the mattress pad and cushioning layer right up front. You’ll easily be able to find a description on the manufacturer’s website, mattress tag and elsewhere. If you can’t find this info with ease, the chances are pretty good the content of the product are cheap. Aside from springs, the other option is foam. 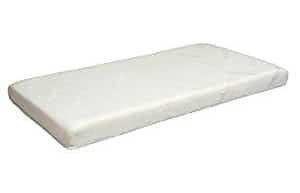 Most foam mattresses are made from polyurethane, but some have proprietary foam construction made from unique materials. Foam is lightweight, waterproof and conforms well to the shape of anybody, even tiny ones. When shopping for a foam mattress, you want to test the firmness. You’re looking for something which is firm, resilient and even a bit on the heavy side. It’s okay if a baby mattress is slightly stiff and heavy at first. Foam will typically soften up over time. Check foam firmness by pressing on the center and the edges. The indentation shouldn’t last long. You want almost instant snapback. Fold which molds too easily doesn’t provide enough support. Density is another important factor. The denser the foam is, the better. Density can be determined by placing your hands on each side of the mattress and pressing towards the center. Your hands should not be able to touch – ideally, they shouldn’t even come close. The more resistance, the denser the foam. Both spring and foam mattresses will have a cover. These are usually made of either vinyl or fabric. Fabric breathes better, which makes the mattress cooler. Fabric covers are usually the best option if you live in an especially warm location. On the other hand, vinyl is more durable. Multilayered vinyl is puncture and tear resistant. Plus, vinyl is often easier to clean. You simply wipe it down with a damp cloth. If you want the most durable cover possible, look for three-ply vinyl. This triple lamination creates a tough outer shell which is very resistant to damage over the long term. A three-ply vinyl cover will typically last the longest out of any type of cover material. Stay away from antimicrobial covers. While they seem like a good idea, they’re really nothing more than a marketing gimmick. The best way to prevent bacteria from forming on the mattress cover is to simply wipe it regularly with soap and water. If you want to store your mattress for an extended period of time, follow these steps. Clean the cover with soap and water. Let it dry thoroughly (this is super important). Place the mattress in a special storage bag. Make sure the bag is clear because light helps prevent bacteria growth. Then store the bagged mattress in a dry, well-ventilated space. Avoid storing in a basement or attic. You’ll notice a common complaint about many cot mattresses. They smell weird. In some cases, the smell can seem overpowering. What’s going on here? Don’t worry. This isn’t a sign of anything unusual or dangerous. It’s simply a side effect of the manufacturing process. When any adult or baby mattress is made, it’s immediately sealed in airtight polythene packaging. This keeps it sterile, dry and clean. But the chemicals used to process the fabric and vinyl remains. When you open the package, the smells from the factory are, well, unleashed. This chemical smell can be very unnatural and even downright unpleasant. But the solution is simple. You just need to give the mattress a day or two to air out. Place it in a well-ventilated area and let it sit. In most cases, the smell will disappear in no more than 48 hours. Think of it like this: The “new” smell is proof that your mattress is clean and sterile. It’s actually a clear indication that your product contains no bacteria, toxins or anything else dangerous. 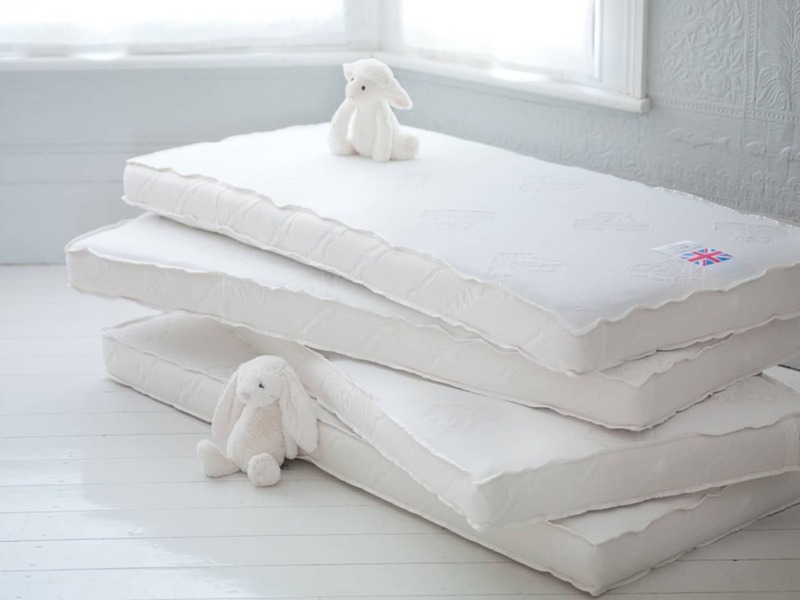 Firm but comfortable, Mother Nurture’s cot bed mattress is a good choice for newborns through to older infants. The quilted cover is machine washable for quick, easy care. 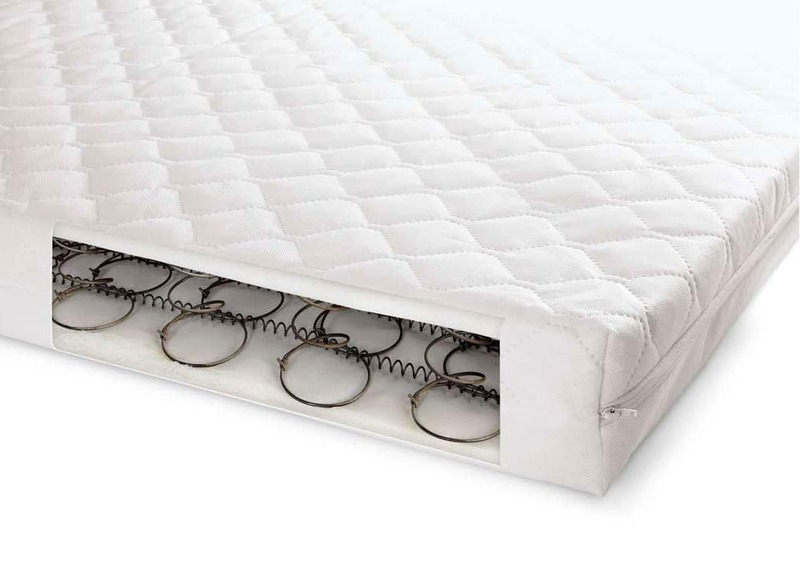 This is a combo mattress consisting of steel springs encased in foam. There’s also a waterproof inner liner which helps prevent the core from liquid exposure. Easy to clean and designed to last through several growth stages. Every aspect of the product is completely hypoallergenic. Babies with asthma, eczema and other allergies will be completely protected. The mattress allows you to put your baby in the recommended Feet to Foot position, and also meets all relevant British safety standards. You don’t have to sacrifice comfort for safety. This is a solid choice if you want an easy-to-clean, safe toddler mattress for cot beds designed to last for years. The dimensions are 140 x 70 x 10 cm. 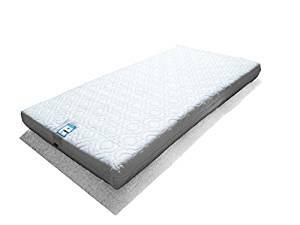 This a spring mattress which provides plenty of spine support and comfort. The base is covered with a unique Stockinette and an adjustable waterproof membrane. The quilted cover is easily removed and machine washable. The Bennelli springs are covered by high-density CMHR28 foam. You get the solid support of springs with the flexibility of foam. Breathable, hygienic and recommended for the unique needs of a baby’s spine. Dimensions are 140 x 70 x 10 cm. An Exclusive from Baby Best Buys, this is a thick, comfortable cot mattress with a solid construction. The profile is overall an impressive 10cm thick. The membrane is waterproof and easily removed. Plus, the membrane can be easily adjusted. Ideal for Feet to Foot positioning. There are no worries about hygiene as the membrane can simply be thrown into the wash whenever you need a quick clean. Fits cots sized 117 cm by 55 cm. Poppy’s Playground is a U.K. company with a long-standing reputation for quality children’s bedding’s. Their baby cot bed mattress continues this tradition with a high-density foam which is breathable, water repellent and anti-allergenic. 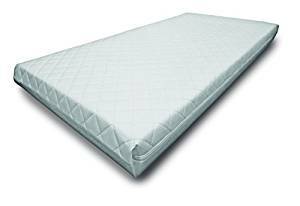 The mattress has padded-diamond quilted fabric which is breathable, water repellent and anti-allergenic. Suitable for kids with asthma and other breathing sensitivities. Underneath the padding is a high-density foam which provides comfort and support. Poppy’s Playground uses a unique Open Cell structure which creates a stable base yet still allows for plenty of airflow. The child-safe foam contains no antimony, phosphorus, arsenic or other potential hazards. Cleaning is simple. Simply unzip the cover and throw it in the wash at 40 degrees. All mattresses are hand-made in the UK with a complete lifetime warranty. Dimensions are 140 x 70 x 10 cm. Turns out, there’s a fair amount of science behind many of the best cot mattresses. Clevamama’s ClevaFoam has a unique design and story. Developed with help from Trinity College Dublin, ClevaFoam was created from the ground up with the goal of providing safe, healthy support for babies and toddlers. Basically, ClevaFoam is an improved version of memory foam. 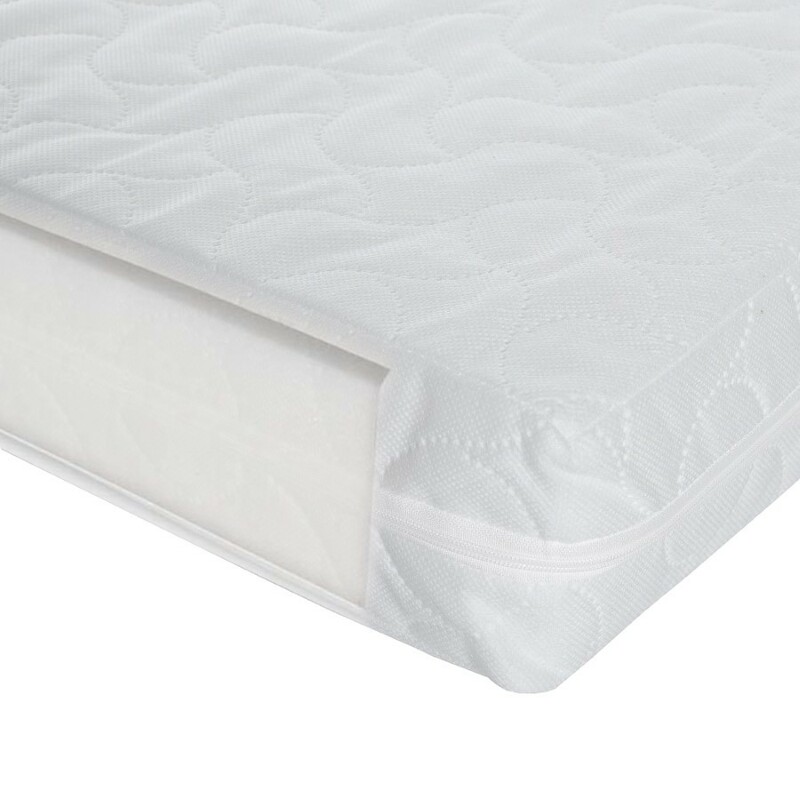 While memory foam has a dense structure which restricts airflow, CleavaFoam’s open structure increases breathability which reduces heat retention. This unique material helps reduce Flat Head Syndrome, supports developing joints and encourages restful sleep. Dimensions are 140 x 70 x 9.5 cm for the cotbed mattress or 120 x 60 for the cot mattress. 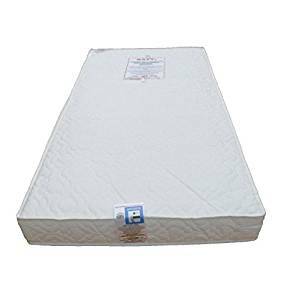 You can trust all of the cot bed mattress reviews mentioned above are of products which help keep your baby safe and comfortable. None of them contain dangerous chemicals or are fire hazards. Plus, they’re all designed specifically for the needs of growing newborns and infants. If you specifically want to prevent Flat Head Syndrome, the Clevamama ClevaFoam Support and Poppy’s Playground have unique construction designed to help prevent it from developing. My top recommendation for the best cot bed mattress is the Mother Nurture Luxury Spring. Combining the benefits of both spring and foam padding, this mattress blends comfort with breathability. Plus, the waterproof liner prevents liquids from seeping into the core – which is one of the major causes of baby mattress damage. Another benefit of the Mother Nurture Luxury Spring is how long it lasts. You can buy this for a newborn but use it for years as your child grows into an infant. Easy to clean and completely hypoallergenic, your child’s cot bed will easily stay reliably hygienic. Overall, I think this is certainly the clear winner, and it’s the one I have no hesitation in recommending to my friends. Choosing the best cot bed mattress for your child can be nerve-wracking, but plenty of safe, comfortable options are available. Because, for a new parent, there’s no greater comfort than peace of mind.